06/17/97 : Added 2nd expansion unit, data recorder, printer, 16k memory cart, FileForm, FinForm and Utopia software packages. 08/26/03 : Picked up 3rd system complete in box with manual and cassette of software. 01/15/06 : Picked up spare cassette deck for $1.99. The system for the seventies, built in the eighties. Maybe that's why it bombed. 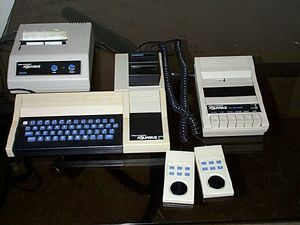 While I was sitting around playing with my Apple ][+, this system was helping to bankrupt Mattel Electronics. At the time, I had never even heard of the computer so of course, years later, I wanted one in my collection. It's a strange little computer. Without the 16k ram cartridge, I have a whopping 1.7k of free ram when I'm in it's built-in Microsoft BASIC. It's chicklet keyboard makes for a rip roaring time typing. Still, it is an interesting piece of home computing history and, not counting my Z-80 CP/M card for my Apple, this was my first Z-80 based machine. For some interesting history about the Aquarius and the Mattel Intellivision game machine, be sure and check the Blue Sky Rangers link below. Now, the usual request for doc, cartridges and peripherals; if you've got'em then email me.